Will new games be announced? After the Blizzcon opening ceremony, on the Mythic stage, Blizzard will host a panel called Diablo: What's Next. The description invites us to "Join the Diablo team as they discuss what's in store for the heroes of Sanctuary." The session is followed by another panel on Sunday November 4 called Diablo: World and Q&A in which developers "explore the world of Sanctuary." The initial session is the first of five panels that day covering all of Blizzard's big games, but it's notable that it opens the show. 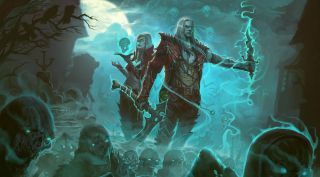 Blizzard has kept Diablo 3 ticking over with the excellent Necromancer expansion and regular free seasonal updates but the structure of the series' long term future hasn't been discussed publicly. However, back in August Blizzard did confirm that there are "multiple Diablo projects in the works." "Some of them are going to take longer than others, but we may have some things to show you later this year." Diablo skipped Blizzcon last year, but this year it's opening and closing the conference on the main stage, so there could be significant announcements. There's a month to wait but we can speculate about Diablo's future until then.